Join us for summer fun with your group! Bring a group to the ballpark! 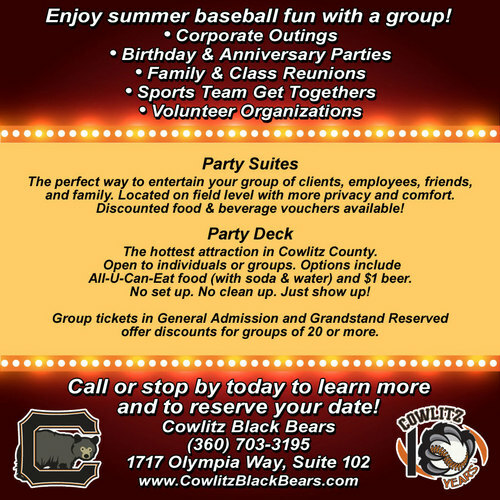 Come have an unforgettable night of fun and baseball with the Cowlitz Black Bears! A group night is the perfect way to celebrate with your coworkers, bring the family together, or gather your friends in a relaxed and social atmosphere. We'll do all the work so you can simply enjoy your outing. You might even throw the ceremonial first pitch or play a between inning game for prizes! Call the office at (360) 703-3195 or stop by 1717 Olympia Way, Suite 102 in Longview to learn more and to reserve your date. Click here for group options and special discounted pricing.